How many film franchises can boast that their seventh entry is actually the best? Of course, when the first film in your series is “The Fast & the Furious” that’s not really saying all that much. However, “Furious Seven” the SIXTH sequel in this mindbogglingly successful franchise is actually the most well-rounded, epic, entertaining, and satisfying as anything that came before it. The series really has done a complete 180. It started out as a lame street racing drama and has become a must-see series of action-packed heist and James Bond-esque spy thrillers that are merely shadows of its rocky beginnings. Horror director James Wan, hot off the success of his “Insidious” films and “The Conjuring” goes a completely route by tackling his first action film. He brings a fresh eye to the series but the film maintains the same sense of absurdity and state-of-the art stunt and effects that fans of these films crave. There are more fights, crashes, and ridiculousness to fill three films. Dominic Toretto (Vin Diesel) and his “family” return but this time he’s back in the US living a quiet retired life. That is, until Jason Statham’s Deckard Shaw shows up to get revenge for his brother (the villain from the previous movie). Another mysterious character known as Mr. Nobody shows up who needs help finding a kidnapped computer hacker who can hack into a God-like computer system that can find the location of anyone in the world. If Dominic and his team can retrieve the hacker then Mr. Nobody will let him use the program to track down Shaw. What comes next is nothing short of crazy, thrilling, and completely ludicrous set pieces involving dropping vehicles out of planes and cars driving through buildings INTO other buildings. Things like physics and gravity never seem to be an issue. The filmmakers know that by now the fans crave this stuff and have certainly upped the ante on crazy stunts and fights. Oh the fights. There are too many to count. In one two characters tussle as they are flying down stairs on a broken door. Another is one of those female-on-female fights so we know that woman can fight just as good as men. If you’re willing to turn your brain off and just take in the action you’re guaranteed to enjoy it. It’s all utterly crazy to the point of being practically comical and you chuckle in spite of yourself. But the thing is: it’s all very well done. You have to hand it to Wan and his crew; everything is expertly staged for maximum enjoyment and suspense. There’s nary a dull moment to be had and the film has a breathtaking use of various striking locations from the deserts of Abu Dhabi to the mountains of Eastern Europe. And I mean they literally drive their cars down mountains and off cliffs. Did I mention it’s ridiculous? 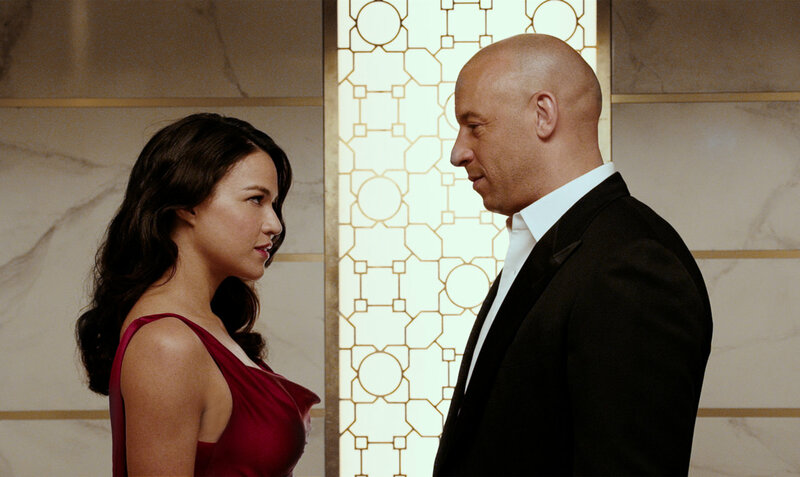 Revised Trailer for Furious 7 on TrailerAddict.